We just had to share some fresh and flirty options for your big day! This gorgeous bouquet inspired this bright color palette. Created by Nest Floral Studio of Lewisville, the bouquet exudes pure natural elegance. This Dessy bridesmaid dress is stunning and playful! You can find this fresh citrus green dress locally at Bridal Boutique in Lewisville. Pair this frock with playful Nina pumps in fuchsia. Stop by Bliss Bridal Salon in Fort Worth to browse all of their colorful shoe options that add a pop of color to your maids! For the perfect touch, use these adorable yellow cushions that add fun to any reception. 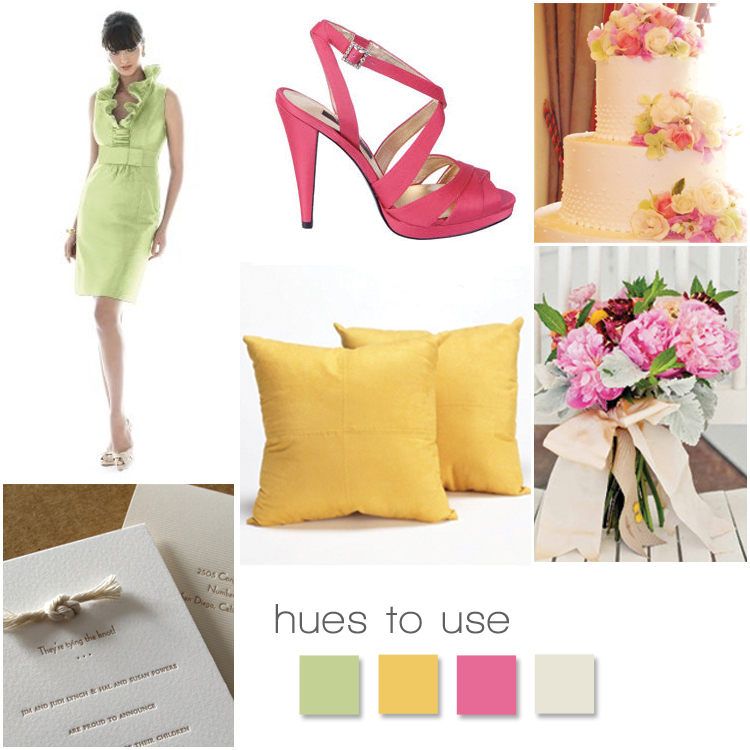 They will dress up your event site with a splash of sunny yellow. These pillows are available at Gloss Luxury Event Rentals. This charming cake with pink petals is another wedding necessity that carries out the theme and was created by Creme de la Creme in Fort Worth. This simple and whimsical invite from Elum ties this inspiration board together with a love knot! Elum invites are found locally at Needle in a Haystack in Dallas! Try these fun details for your fresh and inspired wedding! Happy Friday!